I am so happy to bring you a special little gift in the form of our November Leading Lady Jill Vickers returning for some more fabulous cards featuring our brand new November 2018 Release! Enjoy!! It is wonderful to be on the Winnie & Walter Blog today sharing a few project ideas using new products from the amazing November release. First up is a thank you card featuring In A Word: Thanks (the stamp set). I was so happy when this set came out - along with some coordinating cutaways as well :) The In A Word: Thanks is definitely my all-time most used word die I'm surprised I haven't worn it out yet ;) so having the stamps and additional cutaways to play with is so much fun. For this card, I started by cutting the "thanks" from freezer paper to create iron on masks, and then I applied the masks to a piece of water colour paper by running them through my Minc machine. I used freezer paper because I wanted to play with my pearlescent watercolours for the background but this could also be done with regular masking paper and regular ink blending. I painted the water colour wash over the background and let the paint dry. I then layered the new Scenery: Pennsylvania Polka Creative Screening over the panel and lightly removed the paint from the exposed areas using a baby wipe. I love the subtle effect this leaves. Once all this was done, I removed the masks with the help of my heat gun and then lined up the outline "thanks" stamp on the masked areas and stamped it in grey ink. 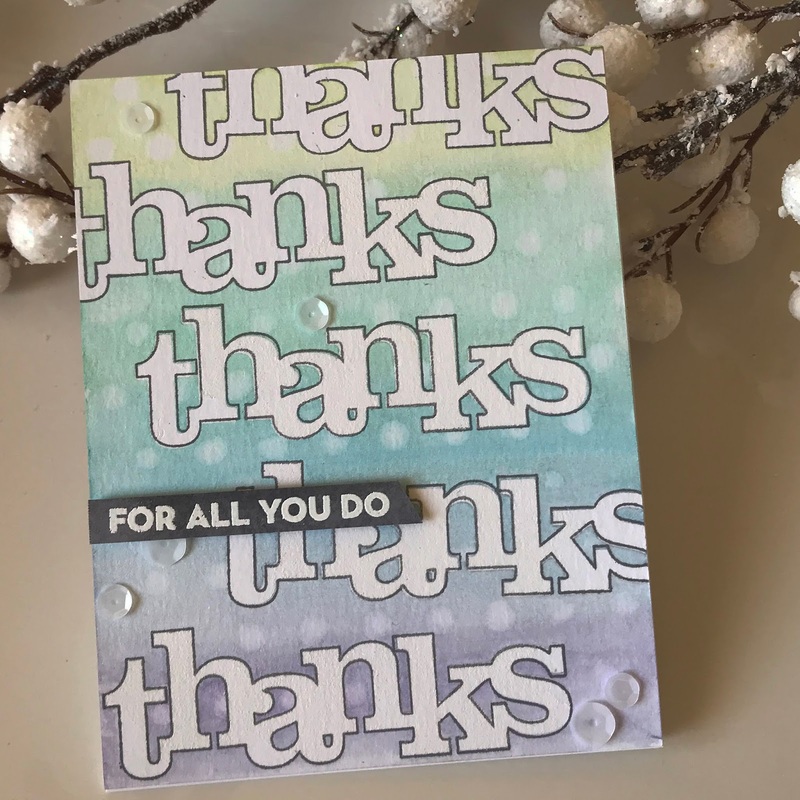 I inked a piece of cardstock using the same ink and then heat embossed a white sentiment from the set onto it. 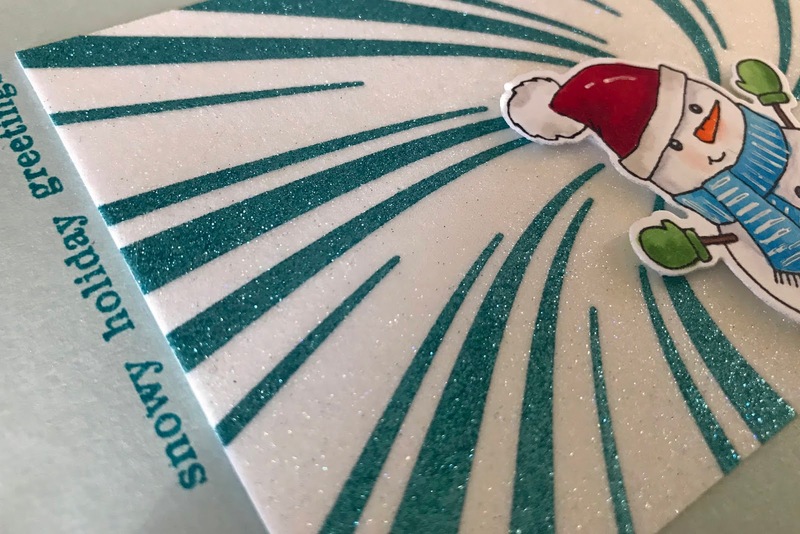 The sentiment was popped up with foam tape and I added a few sequins to finish off the card. 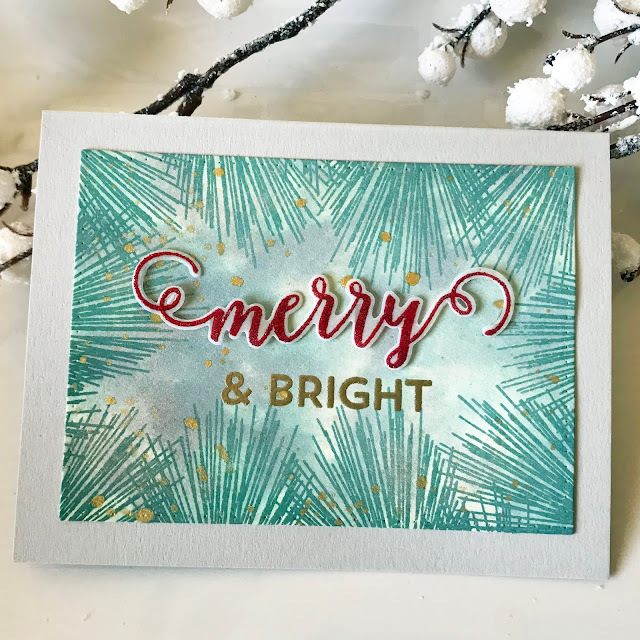 My next card features two of the new products - the Peppermint Zone Cutaway and Snowy Holiday with Evelin T stamps and cutaways. I was so excited when I saw the Peppermint Zone Cutaways - there are so many possibilities with this wonderful die, and I know that it is going to become one of my favourites very quickly. For this card, I used it to create a swirly glittery background. 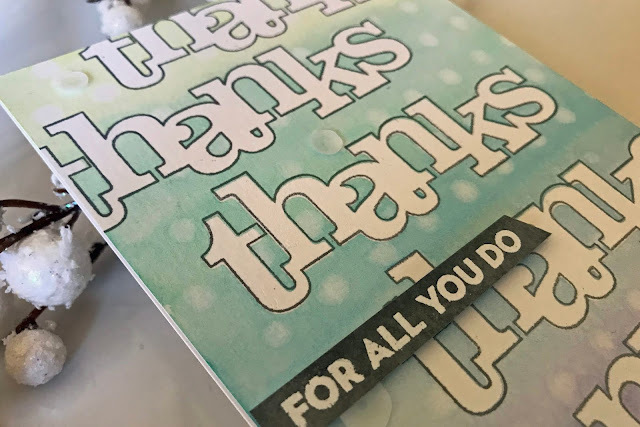 To create the background, I adhered a piece of Be Creative adhesive sheet on top of a heavy weight card stock, and I left the protective sheet in place on the top side of the piece. I then ran it through my Big Shot with the protective sheet against the cutting face of the die - this cut the protective sheet but not the card stock. I carefully removed the pieces of protective sheet covering the "blue" areas and then poured on the blue glitter. After this was all cleaned up, I repeated the process with the remaining area and the white glitter. I love this effect! I added the glittery panel to the front of a pearlescent blue card base. 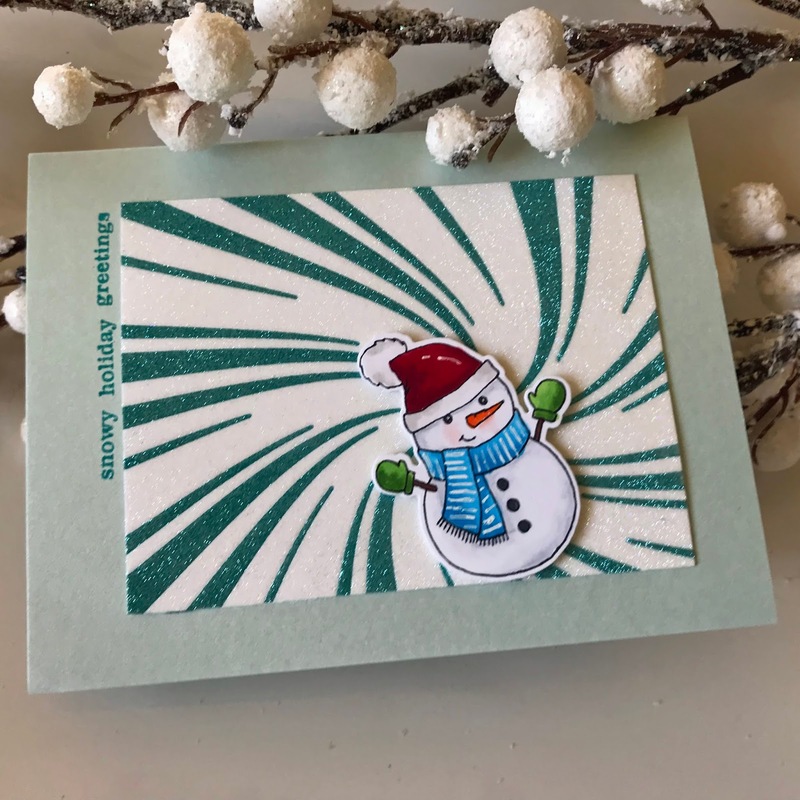 I stamped, Copic coloured and die cut the adorable snowman from Snowy Holiday with Evelin T Designs, and then stamped a greeting from the same set along the side of the panel. My last couple of cards are very similar. I started out by watercolouring two panels with Distress Oxide inks (Evergreen Bough, Iced Spruce) and some pearlescent gold paint - I was trying to create the effect of lights on a Christmas tree. I then added some pine needles using a stamp from In Bloom: Elsa's Flora; on one panel, I stamped the needles differently on each of the panels (as shown below). I also added some gold splatters to each of the panels. 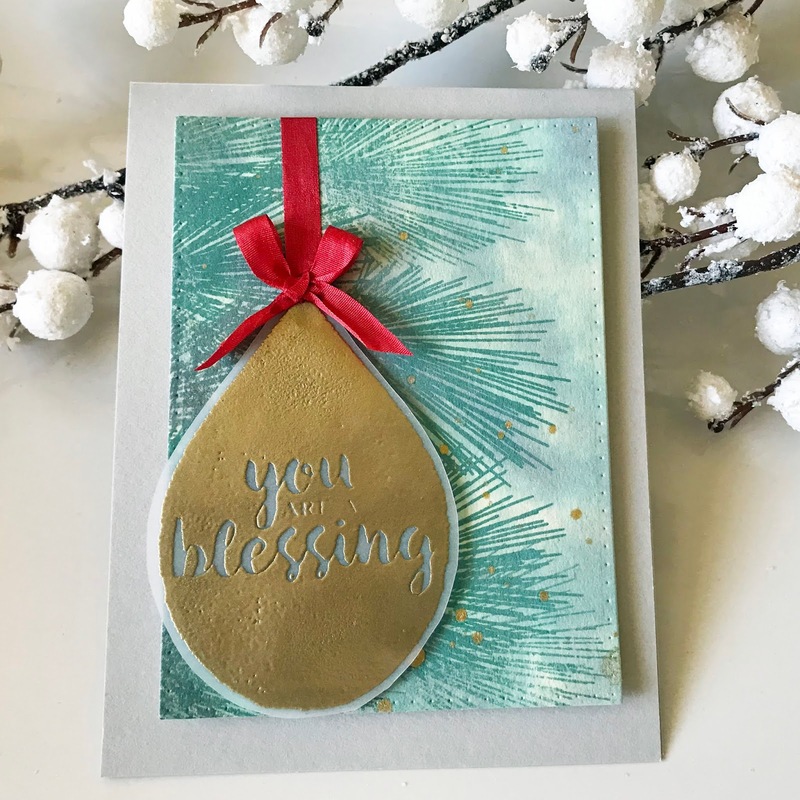 The first card is actually where my inspiration came from - when I first saw the You Are a Blessing stamp set (right now is free with $25 purchase!!!! ), I saw an ornament instead of a leaf and I thought it would make a great seasonal card. I stamped the image onto vellum with Versamark (masking the stem) and then heat embossed it with gold powder. I fussy cut it out and added it to the panel with some foam tape. I also added some red ribbon to make it look like it was "hanging" from the tree. I added the panel to a light grey card base with some more foam tape. The second card is very similar but I used the In a Word: Grand Merry stamp set (another new fave!) and cutaways to create the greeting. 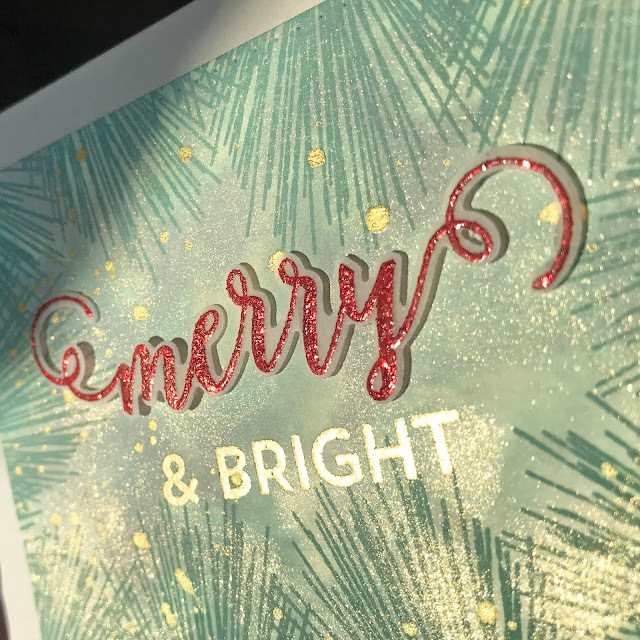 I stamped the curvy "merry" in Versamark on vellum heat embossed with some glittery red powder. I die cut the vellum word with the coordinating cutaway and mounted it with foam tape onto the panel. I heat embossed the second part of the greeting with gold powder to complete the panel before mounting it on a grey card base. Congrats SHartl - I will reach out to you with your prize info! Saw these on your blog & needed another look! Absolutely beautiful & so creative! Congrats to the November winner! Beautiful cards! Love this release! Congratulations to Sachi on her win!!! YAY!! Love all of Jill's cards....just dazzling! 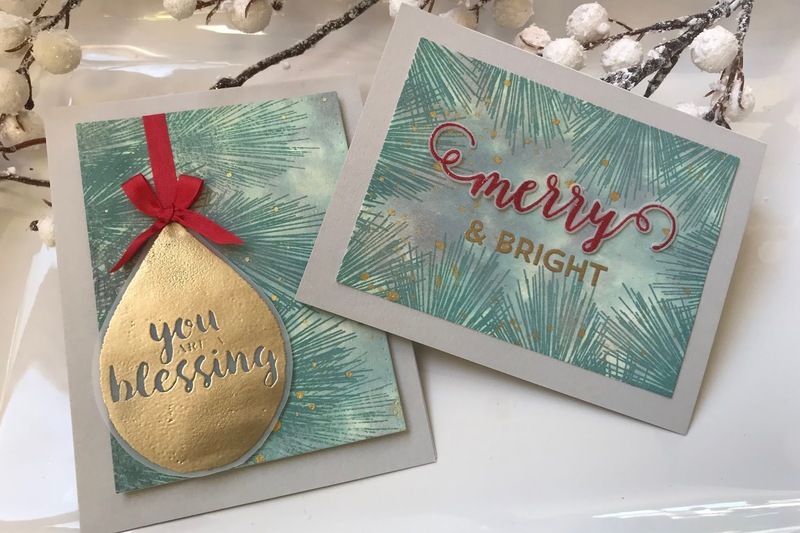 I esp adore the sparkly swirl background and the fabulous pine needle cards. Oh, my....just gorgeous!!! 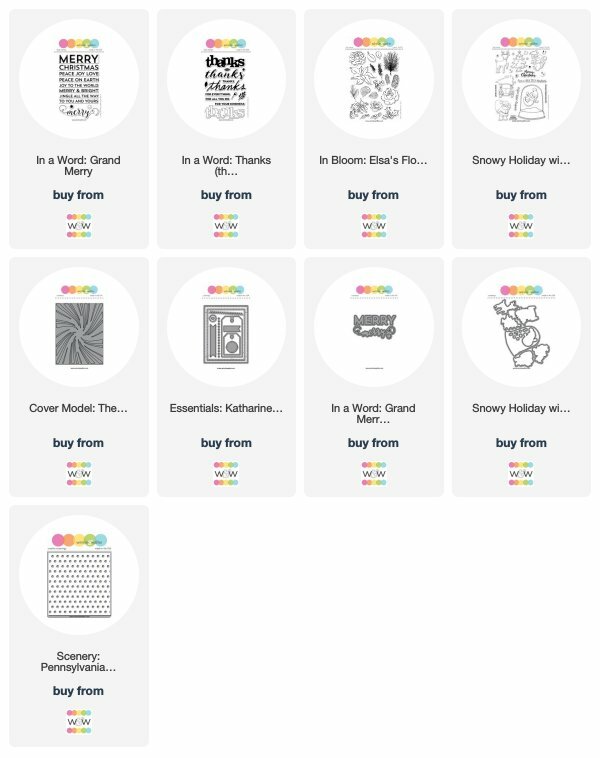 Winners of the November 2018 Release Giveaway!